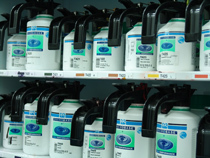 Since waterborne paint contains lower VOC than solvent, it is easier to control the air quality inside a shop or spray facility. 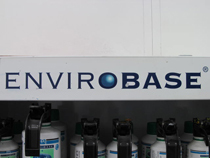 While standard safety equipment is still required, you can virtually eliminate the harsh odors associated with using solvent-borne paint throughout your facility. Global Finishing Solutions spray booth technology assures a durable long-lasting superior paint finish. The downdraft spray booth technology removes airborne particles and collects it for safe disposal. Keeping the area clean of particulates and proper curing is necessary for visual finish, appearance, and durability. We use S/P2 best practices to assure compliance with health, safety and environmental standards. It is Rick’s Auto Body’s philosophy to keep up with all environmental impacts. By focusing on the changes before they are mandated by law, Rick’s will always put every effort into adopting the latest eco-friendly products. Rick’s Auto Body started 50 years ago as a Repair shop. “Rick” understood the importance of a good paint job. The business thrived because of his reputation as a knowledgeable auto body refinish technician. The beauty of a vehicle is not only in design, it is in the sparkle. The color, texture, gloss and feel of the paint are what attracts the buyer. Today’s paint has to be durable, long-lasting, flexible, and stand up to the harshest extremes of hot and cold, salt and sand, arid and wet conditions. 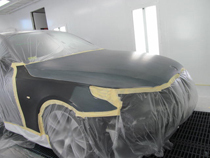 We work with the finest paints, spray booths and equipment to restore vehicles to pre-accident condition. In our eco-friendly car paint repair areas, we use PPG color matching waterborne paint, Global Finishing Solutions down draft spray booths, and advanced pollution prevention filtration. These techniques save the environment from harsh emissions, landfill waste, and safeguard the employees and surrounding community. Rick’s Auto Body was among the first auto body shop in Rhode Island to adopt an eco-friendly philosophy.